This modern secret decoder ring lets amateur ciphers test their knack for code-breaking. While creating a treasure hunt for his two young daughters, Seth Sterling wanted to include a clue that required a secret-decoder ring like those he remembered from his youth. But after a search for one left him empty handed, he decided to design one himself. Modeled in the spirit of those used to crack codes during radio shows of the golden era, such as Little Orphan Annie and Captain Midnight, his modern secret decoder ring lets amateur ciphers test their knack for code-breaking. 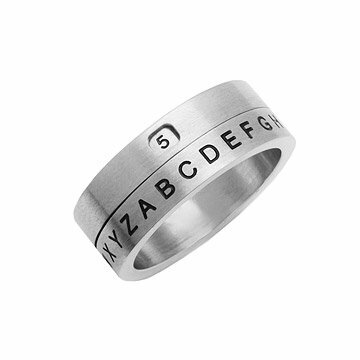 His stylish and smart stainless steel ring reveals a secret code with every turn. Spin the ring to find the hidden letter that each number represents. A game-meets-accessory best enjoyed with your friends, siblings, or partner, you'll have a blast taking turns leaving coded notes for each other to find and figure out. 10-3-24-7 8-23-16! (Have fun!) Made in China. I got this gift for myself and my nieces to add some fun to them learning to write, and to (hopefully) spur letter-writing between us. Plus, I have always wanted a decoder ring ever since I was a little girl. It is well made and spins well. The numbers are a little smaller than I expected, but it still works great. Terrific gift. Excellent quality and fun. Only comes in size 10, so not great for kids to wear as a ring (maybe as a necklace pendant? ) if you want someone to decrypt the coded message, they'll need a ring as well. Bought two. Great choice for my seven year old son! They are well made and the kids were excited but it is hard to read the number inside the ring because it's small. A larger or darker font would be an excellent improvement. Get the large size if the kid is over about 10. I bought 2 of these for my niece (8) and nephew (10) for Christmas. I am giving this to them with a coded Christmas card and a few other notes for their mom to share with them after they open them. I would have loved this as a kid. I can't wait to see how excited they are about their secret coded letters! This ring is well made, fits accurately, and is fun for the whole family. Extremely well made. Moves beautifully. We originally purchased one but upon receipt of the first one, bought another. I will buy again for other grand nieces and nephews. Totally great gift. We are doing a treasure hunt with it. He'll get cards with the locations of the other gifts written in code!